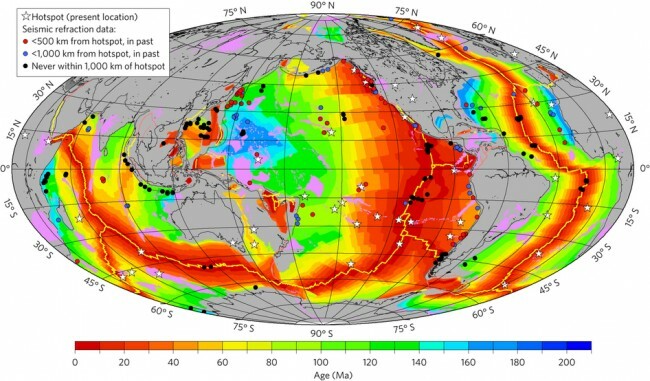 A map created by researchers at The University of Texas at Austin’s Jackson School of Geosciences depicting features of the oceanic crust. The color indicates the age of the crust. The location of seismic refraction data (circles) and mantle hotspots (white stars) were used to examine whether mid-plate volcanism substantially influenced the thickness of aged ocean crust. The modern mid-ocean ridge system is marked by a yellow line and areas in violet outline large igneous provinces. Credit: Harm Van Avendonk. The oceanic crust produced by the Earth today is significantly thinner than crust made 170 million years ago during the time of the supercontinent Pangea, according to University of Texas at Austin researchers. The thinning is related to the cooling of Earth’s interior prompted by the splitting of the supercontinent Pangaea, which broke up into the continents that we have today, said Harm Van Avendonk, the lead author of the study and a senior research scientist at The University of Texas Institute for Geophysics. The findings, published in Nature Geosciences on Dec. 12, shed light on how plate tectonics has influenced the cooling of the Earth’s mantle throughout geologic history. All authors are from the University of Texas Institute for Geophysics (UTIG), a research unit of the Jackson School of Geosciences. The mantle is the very hot, but mostly solid, layer of rock between the Earth’s crust and core. Magma from the mantle forms oceanic crust when it rises from the mantle to the surface at spreading centers and cools into the rock that forms the very bottom of the seafloor. Since about 2.5 billion years ago, the mantle has been cooling —a phenomenon that doesn’t influence the climate on the surface of the Earth and has nothing to do with the issue of short-term man-made climate change. This study suggests that since the breakup of Pangea, the cooling rate of the mantle has increased from 6-11 degrees Celsius per 100 million years to 15-20 degrees per 100 million years. Since cooler mantle temperatures generally produce less magma, it’s a trend that’s making modern day ocean crust thinner. The research that led to the connection between the splitting of the supercontinent and crust thickness started when Van Avendock and Ph.D. student Jennifer Harding, a study co-author, noticed an unexpected trend when studying existing data from young and old seafloor. They analyzed 234 measurements of crustal thickness from around the world and found that, on a global scale, the oldest ocean crust examined—170 million year old rock created in the Jurassic—is about one mile thicker than the crust that’s being produced today. “It’s something that Jenny and I found, more or less, by accident,” Van Avendonk said. The link between crust thickness and age prompted two possible explanations—both related to the fact that hotter mantle tends to make more magma: Mantle hot spots—highly volcanic regions, such as the Hawaiian Islands and Iceland—could have thickened the old crust by covering it in layers of lava at a later time. Or, the mantle was hotter in the Jurassic than it is now. Van Avendonk mentioned this problem during a casual conversation with Joshua “Bud” Davis, a Ph.D. student in UTIG’s plate tectonics research group and co-author, who said that the group could investigate both of the explanations using computer models of plate movement since the Jurassic and a global database of hotspots. The analysis ruled out the hot spot theory—thick layers of old crust formed just as easily at distances greater than 600 miles from hotspots, a distance that the researchers judged was outside the influence of the hotspots. In contrast, the analysis supported the hypothesis of mantle heating during the age of Pangea, and mantle cooling after the breakup of the supercontinent. The finding that splitting up Pangea cooled the mantle is important because it gives a more nuanced view of the mantle temperature that influences tectonics on Earth, Van Avendonk said. The researchers also note that the study illustrates the success that can come from spontaneous collaboration and leveraging basic research on a global scale. For more information, contact: Anton Caputo, Jackson School of Geosciences, 512-232-9623; Monica Kortsha, Jackson School of Geosciences, 512-471-2241.